This is my favorite pizza dough recipe so far. The dough is so easy to work with and gives a nice chewy texture. 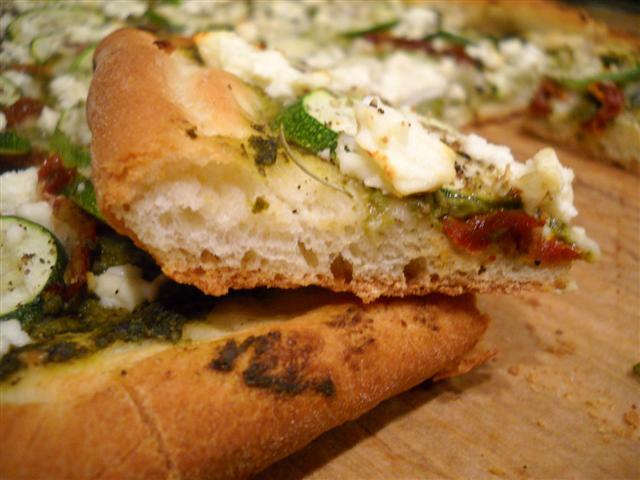 I found the recipe here and have not really changed it, but sometimes I add italian herbs to the dough. To make the dough, stir sugar and yeast into warm water and let it activate for 5 minutes. 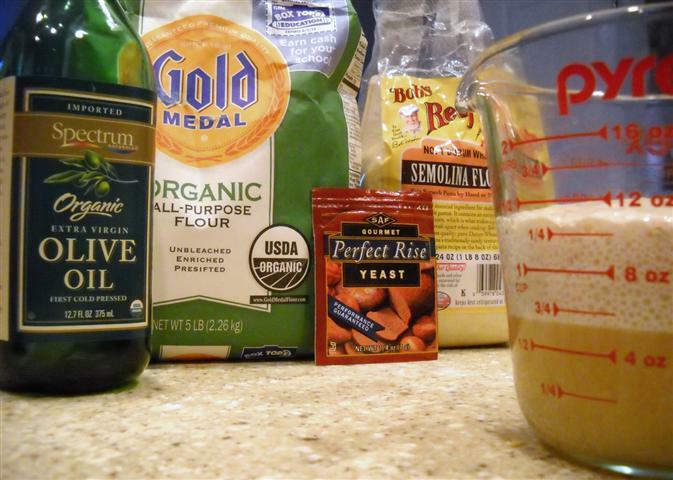 Mix flour and salt in a bowl and add the yeast and olive oil to it, making a soft dough. Knead on a well floured surface for several minutes until the dough becomes smooth. Lightly oil the dough and bowl and cover with a damp towel. Keep in a warm place and let it rise until doubled. Roll the dough to desired shape (mine was rectangular). I like to fold the edged up and over in toward the center to create a “lip” on the crust. Pinch the folded edge together. Let this rest while preparing the toppings. 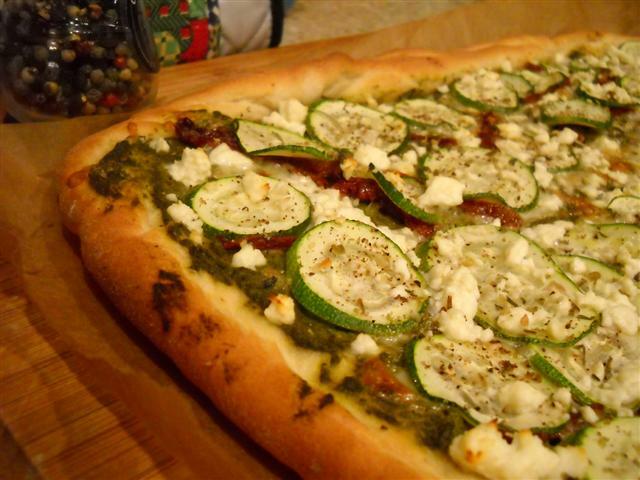 In the meantime preheat the oven to 425 F.
Spread a layer of pesto onto the dough. 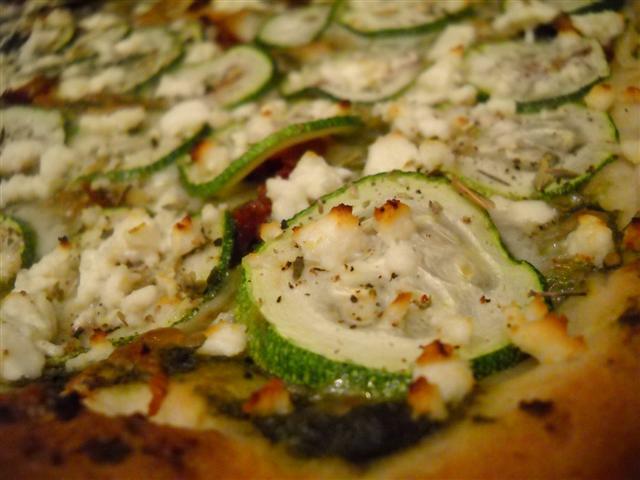 Top with shredded cheese, then sundried tomatoes, then zucchini. Sprinkle with herbs and salt and pepper or whatever seasonings you like. Then crumble the feta cheese over the top. and to Vegetarian Foodie Fridays.